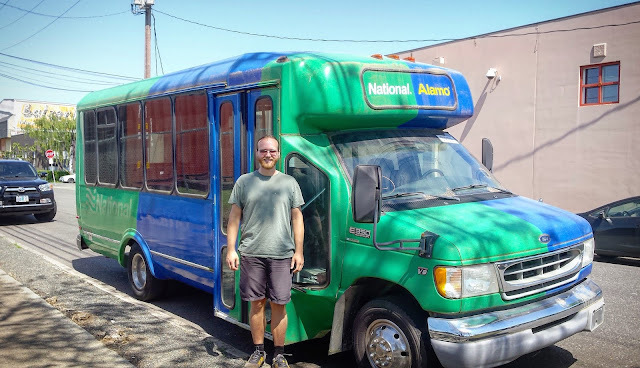 Today I begin a new series of blogs documenting my conversion of a bus into a home. There are lots of ways to survive. I've lived out of a backpack, a small car, the minivan now, and it's enough to get by. I can meet the minimum requirements of life this way. But there are plenty of days where all I want is a private space that's big enough to stand up and move around in, cook something, visit with a friend. Enough room for me and my modest belongings to be comfortable without a lot of clutter. A relaxing home base from which I can do my writing and still travel between various locations. I've been weighing my options for some time now and decided it's time to buy a bigger vehicle that I can make into a truly comfortable, long term living situation. The minivan was a step in this direction, but I considered it a temporary measure, which is why I didn't spend much time repairing or building it. I was on a roadtrip from mid-January til the end of March, starting in Moab and ending up in Portland after wandering around CA and AZ. The first place I went after I left Moab was The Rubber Tramp Rendezvous, in Quartzsite, AZ, a meetup which has grown from less than 200 to more than 2,000 vandwellers in just two or three years. For me the best part is simply being immersed in a large group of people who live the same way I do: I'm used to being that one weirdo trying to be sneaky about where I park, but here I feel completely at ease and accepted as normal. When I see what my friends have done with their vans, I feel inspired to get creative and make my own best version of an efficient little studio on wheels. When I got to Portland I started searching for my new home, on Craigslist and at auctions. Long story short, I checked out some step vans and some buses, did research about engines, found the local auction companies, and kept trying different avenues until I found something I liked for a decent price. I was open to different configurations but I wanted 1) enough vertical space to comfortably walk around in, 2) a reliable diesel engine, 3) something that didn't make me cringe when I looked at it, 4) overall in good shape, 5) as cheap as possible. 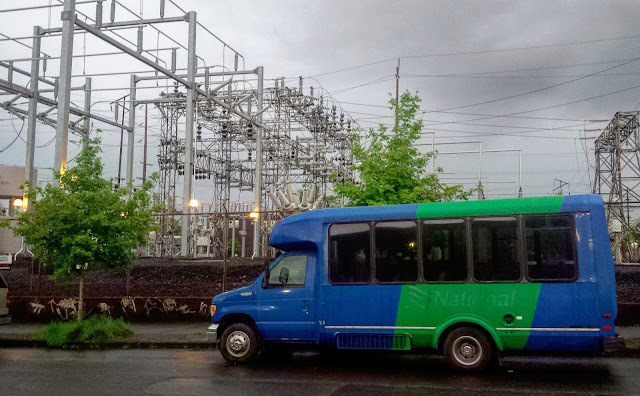 The winner was a bus I found at Copart auctions in North Portland. 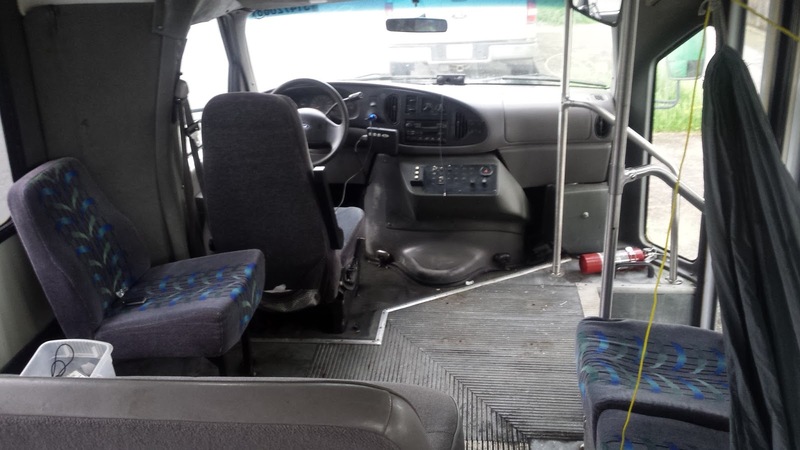 It's a 2002 Ford E-350 with a 7.3L diesel and I got it for $2698 after auction fees (my actual bid was $2100 and to be honest I was surprised how high the fees were, but it was somewhat my fault for not researching this, as it's explained on their website). The bus spent most of its life as a shuttle bus for Alamo/National, taking people between the airport and the rental car place, between 2003 and 2010. Since then it's been owned by a church and not used very much. I picked up the bus on April 26, 2018. The good: the body is in overall good condition. It runs and drives. There's a ton of space inside (roughly 16' x 8' x 6.5' behind the driver's seat). Once I remove the seats and luggage racks I've got a blank slate to work with. There are lots of windows, lots of natural light. It drives more like a van and less like some kind of industrial truck, though it's still very wide. The bad: it has over 336,000 miles on it. I didn't get to do a test drive before buying, and I haven't taken it to a mechanic yet, so there could be some unknown gremlins to deal with. The windows are nice but most of them don't open and I'm a little nervous about how hot it will get inside when it's summer (basically it's a greenhouse). Why did I buy such a high mileage engine even though my intention was to get something with low miles, you might ask? Well, high mileage engines are a lot cheaper, which means with my limited budget I can still get something with a nice body to start building it and living in it, and then if the engine dies I just have to replace the engine. Also, this engine is well respected for its longevity so it's possible I could run it past 500,000 miles without issue, which might be enough for another 10-15 years of driving. At least, the above is what I've been telling myself. The real reason I got an engine with more miles than I wanted is because I'm kind of impulsive and impatient when I shouldn't be, and I wanted this bus even though it isn't completely ideal. There's a balance between waiting forever for the right thing, and just taking what's available and getting to work. I've been in this floaty open-ended kind of travel phase for a while now and it feels nice to have a focus. Everyone does things differently I guess. 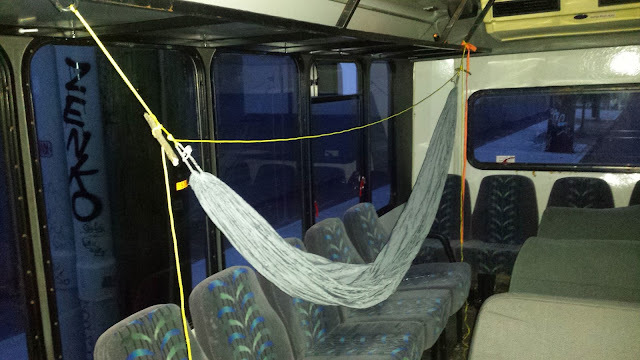 Some may wonder how I was able to afford the bus. I worked at a restaurant in Moab for 4 months and saved about $4,000. Then I spent all that money on my road trip, so that's not where the money came from. I put out a facebook status explaining my situation and saying I'd like to borrow $5,000 to start this build, so that while I'm working to pay it off I'll have a good place to live. One of my friends showed the post to his mom and she was interested. So I met up with her to talk about it: she's in a situation where she's always wanted to spend more time traveling and camping in an RV, and has the funds to do it, but is struggling with the other logistics and how to get started. So on top of the monetary incentive of gaining the interest that I will repay on the loan, she wants to watch me go through this process and get inspired to do something similar one day. It's a pretty good fit because I'm more than happy to talk about the philosophy and the process. As of this writing I haven't done any work on the bus. 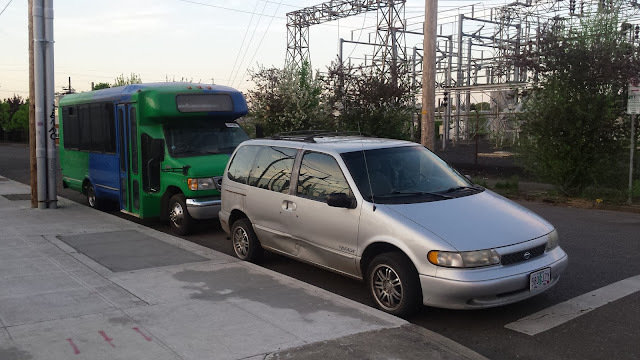 I picked it up from the auction, drove it several miles to inner SE Portland, and parked it there. I'm juggling the minivan and the bus now. Rigged up a hammock inside and smoked the mandatory celebratory joint that first night. I'm in contact with a guy who might let me use some space in his shop, and he's got tools and experience and stuff too, which would be awesome. First step will be to remove all these damn seats. Last thing I need is seating for 27 people. Tried to unscrew the bolts, but they're spinning. One thing you can expect with a van build is that every simple step along the way will have hidden complications! So: this is my introductory post about the bus. I got one! And I like it. And I'm excited to see what happens next. Feel free to write me with questions, comments, or ideas!